“Precision medicine” has become a biomedical buzzword, largely replacing “personalized” or “individualized” medicine. In his 2015 State of the Union Address, President Obama announced a “Precision Medicine Initiative.” I first heard the term in May 2013 as an updating ofThis seems to be about the time its use began to take off. Researching a talk, though, I was surprised to find a much earlier use, from 1979. The sense is the same, but the context very different. 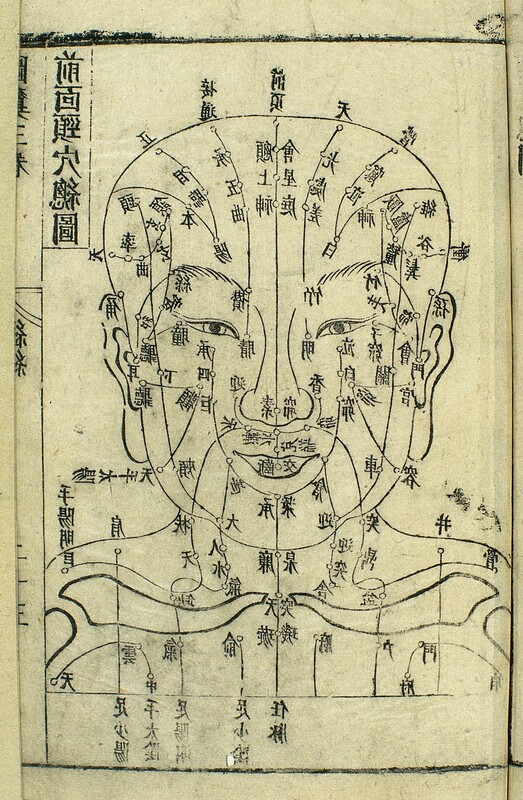 In the first issue of volume 7 of the American Journal of Chinese Medicine, Ling W. Wei, an electrical engineer at the University of Waterloo, Ontario, published an article titled “Scientific advances in acupuncture.” At that time, “alternative” or “comparative” medicine was new enough that he felt the need to define acupuncture as a branch of Chinese traditional medicine. He notes that Richard Nixon’s visit to China in 1972 put acupuncture in the spotlight for Westerners, noting that the scientific community was “aloof and apathetic, if not down right scornful” of the technique. Wei proceeds to evaluate acupuncture as scientific medicine. There’s much to say about this fascinating paper, but I note here just one passage, on pp. 70-71. The trend of technological advance in acupuncture holds great promise of promoting medicine in three directions,” he writes. These are what he calls the “three P’s”: preventive medicine, precision medicine, and people medicine.” This is remarkably close to Leroy Hood and colleagues’ “P4” medicine (“personalized, predictive, preventive, participatory”), first discussed in 2010. Wei’s formulation captures all the sense of Hood’s, but more concisely (preventive follows from predictive). But where Hood’s P4 medicine is predicated on reductive genomics, Wei imagines an equally high-tech but image-based approach. “If the electrical signals from 365 or a selected number of acu-points of the whole body are successively stored and then fed to a specially designed TV monitor, the pattern of this “holography” could tell us the whole story of the person’s health condition and thereby reveal not only the precise origin of the current illness but also perhaps some hidden signs of developing symptoms. To make the interpretations more precise, this holographical pattern could be fed to a “diagnostic computer” and let it be compared to thousands of standard patterns (in storage) of established causes. If a match or near-match is found, then the cause is said to be pinpointed. A man could take a “holography” anytime or once a year and the film can be as small as the palm. If in the future every drugstore had a terminal link (perhaps through telephone lines) to a central computer, one could simply insert his holography film into the machine and get an instant print-out telling his health condition. That day is not too far off; because the technology in opto-electronics and computers is almost ready for this “diagnostic automat” to be within reach. The precision required in acupuncture is obvious and material: you have to put the needles in exactly the right place. It’s rather stunning how close Wei’s vision is to what contemporary precision medicine is aiming at, by very different means. Wei, L. Y. “Scientific Advance in Acupuncture.” Am J Chin Med 7, no. 1 (Spring 1979): 53-75. Last week I reread Owsei Temkin’s classic essay from 1963, “The scientific approach to disease: specific entity and individual illness,” for a course I am co-teaching on individuality and medicine. (I have not found the Temkin essay online. If you would like a copy of it, put a request in the comments section.) In it, Temkin distinguishes between the “ontological” and the “physiological” concepts of disease. An ontological approach treats diseases as specific entities—“things” that exist out in nature and befall humans and other creatures. The best example of an ontological approach to disease is the germ theory: the notion, developed by Pasteur, Koch, and others in the late 19th century, that many common diseases are caused by microbes. An ontological approach treats diseases as static; curing disease entails getting rid of the thing that causes it. An ontological approach gave us some of the greatest triumphs of twentieth century medicine: penicillin, the polio vaccine, the triple-drug AIDS therapy. In contrast, a physiological disease concept treats illness as a process. Temkin also calls this a “biographical” or “historical” concept of disease. A physiological approach is individualized; it treats disease as a unique constellation of disease agent, heredity, experience, and local conditions. In its extreme form, it treats every case as different, because no two individuals have the exact same circumstances. Temkin shows how this approach characterized ancient Greek and Roman medicine, and illustrates how the two, ontological and physiological, have been in dynamic interplay down through the centuries. Thinking about how to explain this distinction to my students, it occurred to me that ontological diseases are nouns, while physiological diseases are verbs. Objects versus processes; things versus actions. This is a little bit crude, but as a mnemonic it works well to remind one of the fundamental distinction Temkin makes. It’s important to remember that these are not properties of the diseases, but of one’s approach to disease. We look at diseases as one little factor…You have cancer. You have heart disease. Well to me, those diseases are verbs. You are cancering. You are heart diseasing. And I want to take you from a disease state, the other direction. After a long and successful run in the twentieth century, the ontological approach to disease has recently ceded the limelight to the physiological disease concept. Genomic medicine is all about individualized or personalized medicine. It promises to end “one size fits all” medicine and treat patients as individuals once again. Individualized medicine is also about prevention—about identifying and stopping disease before it starts. Indeed, Agus segues immediately from diseases-as-verbs to prevention: “And I want to prevent illness.” The physiological approach to disease, individualized medicine, is intimately bound to this notion of disease prevention. Prevention seems an unassailably benevolent goal; however, in this age of intensive medical management and a potent biochemical, pharmaceutical therapeutic style, prevention also means the erosion of the patient as a medical actor. We all become patients. Your health needs to be managed from birth to death, probably with an armamentarium of drugs designed to forestall a battery of diseases for which you have risk factors. Agus seems to say that everyone should take a physiological approach, that all cancer and all heart disease, and perhaps even all diseases are verbs. But Temkin concludes his essay by insisting that neither the physiological nor the ontological approach is “correct.” Rather, one must treat a given disease ontologically or physiologically (or perhaps in some combination), depending on whether one is a patient, a doctor, a researcher, a public health worker, or what have you. It is a marvelous example of how a historical approach to biomedicine—even from an essay half a century old—can deepen our understanding of current events in science, health, and disease. Temkin, Owsei. “The Scientific Approach to Disease: Specific Entity and Individual Illness.” In Scientific Change: Historical Studies in the Intellectual, Social and Technical Conditions for Scientific Discovery and Technical Invention from Antiquity to the Present, edited by AC Crombie. 629-47. NY: Basic Books, 1963. Reprinted in The Double Face of Janus, Johns Hopkins, 1977. “Personalized medicine” is both one of the hottest topics in biomedicine today and one of the oldest concepts in the healing arts. Taking the long view reveals some of the trade-offs in trying to personalize diagnosis and treatment—and suggests that truly personalized medicine will involve not only technological advance, but also moral choices. It is both one of the hottest topics in biomedicine today and one of the oldest concepts in the healing arts. Visionaries of the genome claim that molecular personalized medicine will eliminate “one size fits all” medicine, which treats the disease, and return us to an older approach, in which the patient was pre-eminent. The revolution, they say, will be “predictive, preventive, personalized, and participatory“—it will be possible to identify why this person has this disease now, and even to prevent disease before it starts. Personalized medicine depends on the individual person. But the individual is not a constant. Over the centuries, the medical individual has evolved along with the increasing reductionism of biomedicine. Medicine has narrowed its scope, moving from the whole person, to part of the body, to proteins, DNA sequences, and single nucleotides. Underlying contemporary, genomic personalized medicine are assumptions that, first, molecular medicine operates on a level that unites us all (indeed, all life), and thus it is the best—even the true—way to explore and describe human individuality. And second, that understanding human individuality on a molecular level will lead willy-nilly to better care and a less alienating medical experience for patients. I think a lot of benefit can come out of the study of genetic constitution and idiosyncrasy—and one can hardly oppose the idea of more personal care. But demonizing one-size-fits-all, promising a revolution, and making fuzzy connections between biochemistry and moral philosophy are risky propositions. Personalized medicine today is backed by money and larded with hype. Setting the medical individual in historical context, we can ask what personalized medicine can and cannot claim. In short, what is the difference between personalized and truly personal? The Hippocratic physicians, Aristotle, and Galen all used the concept of diathesis to describe the way a person responds to his environment. They used the term flexibly, to describe everything from a tendency to particular diseases to one’s general constitution or temperament. Around 1800, “diathesis” gained a more specific meaning: it came to signify a constitutional type that made one susceptible to a certain class of diseases. Some diatheses, such as scrofulous, cancerous, or gouty, were believed to be inherited. Others, such as syphilitic, verminous, or gangrenous, were understood as acquired. In its original sense, then, diathesis was related to heredity, but not synonymous with it. As a factor in tuberculosis, the soil, then, has a value equal almost to that which relates to the seed, and in taking measures to limit the diffusion of the parasite let us not forget the importance to the possible host of combating inherited weakness, of removing acquired debility, and of maintaining the nutrition at a standard of aggressive activity. It was a losing battle, though. The germ theorists were winning: diathesis and constitutionalism were already becoming outdated. “One size fits all” medicine is a direct legacy of the germ theory of disease and of the notion that you can isolate the causative agent in any disease. This was a remarkable advance in medical history. It didn’t matter whether you were a princess or a hack driver, doctors could figure out what you had and make you better. The great legacy therapies of microbial medicine—salvarsan, penicillin, the polio vaccine—represented the first times in medical history that doctors actually cured anyone. One-size-fits-all medicine, then, was positively brilliant, a medical revolution, in an age and culture where infectious disease killed a dominant fraction of the population. But it always had critics, doctors and others who bemoaned the loss of complexity, artistry, humanity from the medical arts. One of those critics was the London physician Archibald Garrod. Constitution, or soil, had always been associated with heredity; Garrod linked it to genetics. Garrod was a biochemically oriented doctor, interested in the physiological mechanisms of disease. The phenomena of obesity and the various tints of hair, skin, and eyes point in the same direction, and if we pass to differences presumably chemical in their basis idiosyncrasies as regards drugs and the various degrees of natural immunity against infections are only less marked in individual human beings and in the several races of mankind than in distinct genera and species of animals. Obesity, racial features, drug idiosyncrasies, and sensitivity to infectious disease, of course, are now among the primary targets of genetic medicine. They are also interrelated. For example, take primaquine. After WWI, Germany was cut off from the quinine plantations of Indonesia. German pharmaceutical companies such as Bayer developed synthetic antimalarial drugs, the best of which was primaquine. Primaquine was field-tested in malarial regions such as banana plantations in South America and the Caribbean, especially those run by United Fruit Company. Most of the banana-pickers were black Caribbeans. Researchers found that primaquine was effective, but that about one in ten blacks developed severe anemia when they took it. In whites, this response was extremely rare. This response became known as “primaquine sensitivity.” Today it is recognized as an expression of G6PD deficiency, the most common genetic disease in the world. We knew it was only the blacks who were primaquine sensitive. So that was very important. Second place, the blacks didn’t get malaria. They’re resistant to vivax. So we used black prisoners for studies of hemolysis, we used white prisoners usually for malaria. The future of biochemical genetics applied to medicine is largely in the study of diatheses and idiosyncrasies, differences of innate make-up which do not necessarily lead to disease, but may do so. The young physician Arno Motulsky, of the University of Washington, took that notion as a call to arms. In 1957, he reviewed the literature on drug idiosyncrasy and gave it both context and an audience. “Hereditary, gene-controlled enzymatic factors,” he wrote, “determine why, with identical exposure, certain individuals become ‘sick,’ whereas others are not affected. It is becoming increasingly probable that many of our common diseases depend on genetic-susceptibility determinants of this type.” His short article became a classic and is often cited as the founding paper of pharmacogenetics. The actual term wasn’t coined until two years later, and then in German, by the German researcher Friedrich Vogel: “pharmacogenetik.” In 1962, Werner Kalow published a monograph (in English) on pharmacogenetics. The field soon stalled, however; little was published on the subject through the ‘60s and ‘70s. Pharmacogenetics only really gained traction after the development of gene cloning. Molecular approaches to variation had been developing since the late 1940s. In 1949, using the new electrophoresis apparatus—biology’s equivalent of a cyclotron—the great physical chemist Linus Pauling found that the hemoglobin of sickle-cell patients had different mobility than normal hemoglobin. He called sickle cell “a molecular disease.” It was also, of course, considered a “black disease,” for reasons connected to primaquine sensitivity. Pauling once suggested that carriers of sickle cell and other genetic diseases should have their disease status tattooed on their foreheads as a public health measure. It was the kind of step eugenicists of the Progressive Era might have applauded. Pauling was a brilliant and imaginative analyst, but he was not a visionary. He did not foresee that all diseases would become genetic. The study of molecular diseases was greatly aided by technological developments that aided the separation, visualization, and purification of the proteins in biological fluids. Searching for alternative media to replace paper, researchers experimented with glass beads, glass powders, sands, gels, resins, and plant starch. Henry Kunkel used powdered potato starch, available at any grocery. Although inexpensive and compact enough to fit on a tabletop, one could use it to analyze a fairly large sample. Still, electrophoresis with starch grains had its drawbacks. In 1955, Oliver Smithies, working in Toronto, tried cooking the starch grains, so that they formed a gel. This not only made the medium easier to handle and stain; it made the proteins under study easier to isolate and analyze. Starch gel democratized electrophoresis. Immediately, all sorts of studies emerged characterizing differences in protein mobility; many of these correlated biochemistry with genetic differences. Bateson’s variation had been brought to the molecular level. Sickle cell, the black and molecular disease, continued to play a leading role in the study of genetic idiosyncrasy. In 1957, using both paper electrophoresis and paper chromatography, Vernon Ingram identified the specific amino acid difference between sickle cell hemoglobin and “normal” hemoglobin—specifying Pauling’s “molecular disease.” An idiosyncrasy—or diathesis—now had a specific molecular correlate. Polymorphism is a population approach to idiosyncrasy. Imported from evolutionary ecology, as a genetic term polymorphism came to connote a regular variation that occurs in at least one percent of the population. Where the ecologist E. B. Ford had studied polymorphisms in moth wing coloration, the physician Harry Harris studied it in human blood proteins. Like Garrod, Harris wanted to know how much non-pathological genetic variation there was in human enzymes. He concluded that polymorphism was likely quite common in humans. Indeed, Harris identified strongly with Garrod; in 1963, he edited a reissue of Garrod’s Croonian Lectures of 1909, Inborn Errors of Metabolism. Together with Lionel Penrose, an English psychologist interested in the genetics of mental disorders, Harris headed up an informal “English school” of Garrodian individualism and biochemical genetics, located at London’s Galton Institute. Harris fulfilled Garrod’s vision by categorizing amino acid polymorphisms and relating them to human biology. Barton Childs and family in the 1950s (courtesy Anne Childs). We only do this once, it’s our inheritance, Joined by this common thread — black, yellow, white or red, It is our family bond, and now its day has dawned. This draft was made for you and me. Since then, the genome’s supposed refutation of a biological race concept has become a standard trope among scientists, journalists, and historians. But the SNP database turned out to be too data-rich. Human genetic diversity is far too great to be useful to our poor small brains and computers. Circa 2001, it was discovered that SNPs cluster into groups, or “haplotypes.” Most of the information in a complete SNP map lies in 5% of the SNPs. This brings the number from ten million down to half a million or so. Conveniently, haplotypes cluster by race. In October, 2002, an International HapMap Consortium convened. The HapMap project sampled humanity with 270 people drawn from four populations. There were thirty “trios”—father, mother, and adult child—from the Yoruba of Nigeria—part of an African diaspora widely and condescendingly noted for its literacy. Thirty more trios were white Utahns of European ancestry. Forty-five unrelated individuals were drawn from Japanese in Tokyo and Han Chinese in Beijing (China boasts more than fifty ethnic groups, the largest of which is the Han). No native Australians or Americans, North or South, were included. Conceptually, the HapMap project was a mess. It claimed to explore human diversity while genetically inscribing and condensing racial categories—which in turn were defined by the project in terms of highly cosmopolitan and otherwise problematic groups. It implied that the Yoruba were representative of “Africans,” the Japanese and Chinese of “Asians.” Framed as a corrective to the disastrous but well-intentioned Human Genome Diversity Project of the 1990s, it nevertheless reinforced the racial categories that the genome project was supposed to have shattered. Indeed, Venter’s proclamations and Collins’s corny folksongs notwithstanding, the use of race has actually increased in studies of genetic polymorphism in response to drugs. I looked at the number of papers listed in PubMed that had “pharmacology” as a keyword, and the fraction of those papers that also had “race” as a keyword. That proportion held fairly steady at about a third of a percent from the ‘70s through the ‘90s. But it nearly tripled in the decade after we got the genome, to more than three quarters of a percent: from 34 to 359 publications. Once a sport, a rare mutation in the pharmacological literature, race is now approaching the frequency of a polymorphism. So either race does have a scientific basis after all, or scientists are using a social construct as if it were a biological variable. Either way, there’s a problem. BiDil and BRCA2 As Beutler used skin color as a proxy for primaquine sensitivity and malaria susceptibility, so physicians today are using it as a proxy for haplotype. For example, take the heart-failure medication BiDil. In 1999, this drug was rejected by the American Food and Drug Administration, because clinical trials did not show sufficient benefit over existing medications. Investigators went back and broke down the data by race. Their study suggested that “therapy for heart failure might appropriately be racially tailored.” The licensing rights were bought by NitroMed, a Boston-area biotech company. Permission was sought and granted to test the drug exclusively in blacks, whose heart failure tends to involve nitric oxide deficiency more often than in people of European descent. On June 23, 2005, FDA approved it for heart failure in black patients. As a result, it became the first drug to be marketed exclusively to blacks. The study’s author claims congestive heart failure is “a different disease” in blacks. This argument thus presupposes that “black” is an objective biological reality, and then identifies health correlates for it. Ethnicity is not so black-and-white. Another well-known case is the gene BRCA2, a polymorphism of which increases the risk of breast cancer. Myriad Genetics, founded by Mark Skolnick, cloned BRCA1 and 2, and took out patents on tests to detect them. Myriad gets a licensing fee for all tests. The BRCA2 mutation is found mainly in Ashkenazi Jews. Due to the wording of the European patent, women being offered the test legally must be asked if they are Ashkenazi-Jewish; if a clinic has not purchased the (quite expensive) license, it can’t administer the test. Gert Matthijs, of the Catholic University of Leuven and head of the patenting and licensing committee of the European Society of Human Genetics, said, “There is something fundamentally wrong if one ethnic group can be singled out by patenting.” The case has been controversial. The patent was challenged, and in 2005, the European Patent Office upheld it. The next year, the EU challenged Myriad. In 2010, an American judge invalidated the Myriad patents. This spring, opening arguments began in the appeal. No one can predict the outcome, but some investors are betting on Myriad. The point is not hypocrisy but internal contradiction. 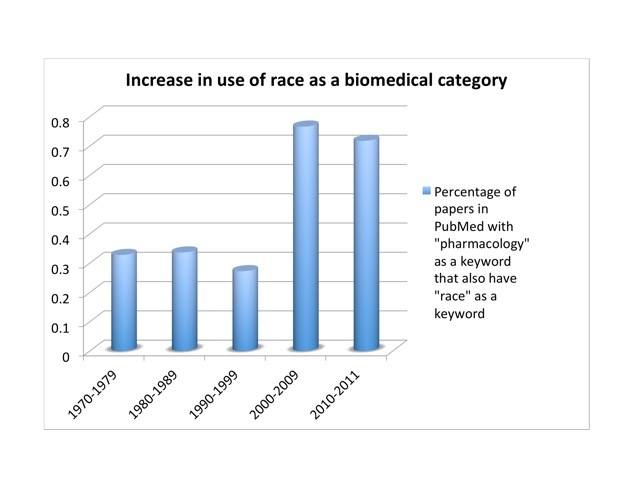 As the ethicist Jonathan Kahn points out, “Biomedical researchers may at once acknowledge concerns about the use of race as a biomedical category, while in practice affirming race as an objective genetic classification.” There’s a deep cognitive dissonance within biomedicine between the public rhetoric and the actual methodology of fields such as pharmacogenetics over the question of whether or not race is real. And this of course has a strong bearing on the question of individuality. Which is it, doctor: are we members of a group, or are we individuals? 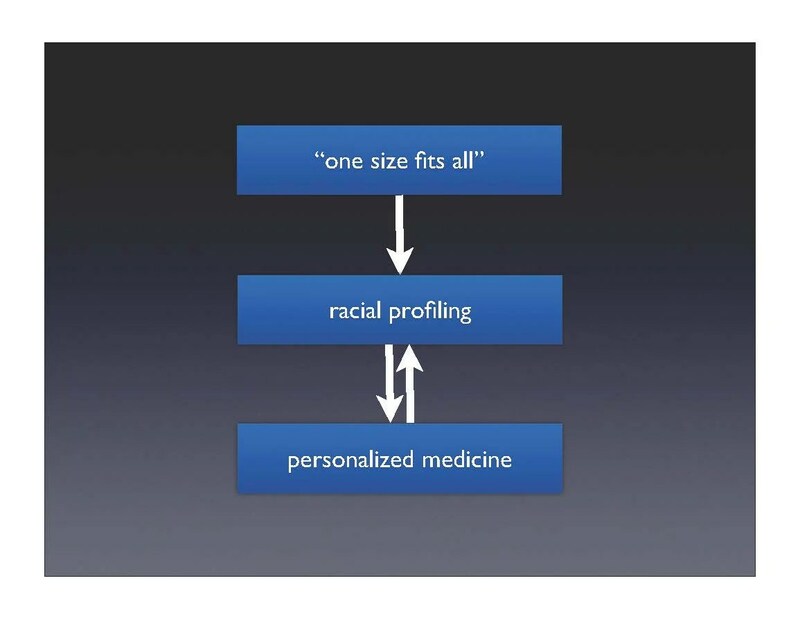 So although biomedicine claims to be moving from “one size fits all” to personalized medicine, in practice, researchers find that race is a necessary intermediate step in getting from the entire population to the individual. The claim is that individuality is on the horizon—once the databases fill out and testing costs come down, medicine will be truly personalized. In the meantime, though, we’ll put you in a smaller group, which is better than treating everyone the same. The history shows that treating the individual always involves putting that individual into one or another group. It is neither possible nor even desirable to treat everyone uniquely. When faced with the vastness of human variation, the complexity quickly becomes overwhelming. One has to look for patterns in the data, to group people by their responses. In practice, this often seems to mean typing people according to familiar categories. These categories are of course drawn from the experience of the researchers: if you grow up in a culture where race is real, then those are the categories into which your data fall. Biomedicine is not separate from culture; so long as race exists in our society, it will imprint itself on our science. In this way, the drive for individualism often leads to its opposite: typology. Race becomes reified—it now has an empirical and apparently unbiased basis. Individuality in biomedicine, then, has long been an elusive concept. Biomedical researchers claim with justifiable pride that medicine is beginning to take the individual seriously once again. Specialties such as pharmacogenomics and personalized medicine are increasingly recognizing that not everyone responds the same way to a given disease or a drug. This is a good thing, and could both improve therapeutic effectiveness and reduce incidence of idiosyncratic toxic responses. On the level of technical diagnostics and therapeutics, I see many benefits from tailoring care to whatever extent possible. But that doesn’t make it personal. Science can’t eliminate the concept of race, let alone racial prejudice. It can’t make our doctor take us seriously and treat us respectfully. It’s at best naive and at worst cynical for clinicians and researchers to suggest otherwise. We should always be wary of claims that science & technology will solve social problems. Truly personalized medicine is more than a problem of technology, data collection, and computation. It has to be a moral choice. Acknowledgments This essay is based on a talk delivered to PhD Day in the Division of the Pharmaceutical Sciences, University of Geneva, and was shaped by questions, comments, and discussion afterward. Michiko Kobayashi provided valuable comments and criticisms on both the talk and the essay. Ackerknecht, Erwin. “Diathesis: The Word and the Concept in Medical History.” Bull. Hist. Med. 56 (1982): 317-25. Bateson, William. “An Address on Mendelian Heredity and Its Application to Man.” British Medical Journal (1906): 61-67. Bearn, Alexander G. Archibald Garrod and the Individuality of Man. Oxford, U.K.: Clarendon Press, 1993. Burgio, G. R. “Diathesis and Predisposition: The Evolution of a Concept.” Eur J Pediatr 155, no. 3 (1996): 163-4. Childs, Barton. “Sir Archibald Garrod’s Conception of Chemical Individuality: A Modern Appreciation.” N Engl J Med 282, no. 2 (1970): 71-77. Comfort, Nathaniel C. “Archibald Edward Garrod.” In Dictionary of Nineteenth-Century British Scientists, edited by Bernard Lightman. London, Chicago: Thoemmes Press/University of Chicago Press, 2004. Garrod, Archibald Edward. Inborn Errors of Metabolism: The Croonian Lectures Delivered before the Royal College of Physicians of London in June 1908. London: H. Frowde and Hodder & Stoughton, 1909. ———. The Inborn Factors in Disease; an Essay. Oxford: The Clarendon Press, 1931. Hamilton, J. A. “Revitalizing Difference in the Hapmap: Race and Contemporary Human Genetic Variation Research.” The Journal of Law, Medicine & Ethics 36, no. 3 (Fall 2008): 471-7. Jones, David S., and Roy H. Perlis. “Pharmacogenetics, Race, and Psychiatry: Prospects and Challenges.” Harvard Review of Psychiatry 14, no. 2 (2006): 92-108. Kay, Lily E. “Laboratory Technology and Biological Knowledge: The Tiselius Electrophoresis Apparatus, 1930-1945.” Hist Philos Life Sci 10, no. 1 (1988): 51-72. Nicholls, A. G. “What Is a Diathesis?” Canadian Medical Association Journal 18, no. 5 (May 1928): 585-6. Wailoo, Keith, and Stephen Gregory Pemberton. The Troubled Dream of Genetic Medicine: Ethnicity and Innovation in Tay-Sachs, Cystic Fibrosis, and Sickle Cell Disease. Baltimore: Johns Hopkins University Press, 2006. Slater, L. B. “Malaria Chemotherapy and the “Kaleidoscopic” Organisation of Biomedical Research During World War II.” [In eng]. Ambix 51, no. 2 (Jul 2004): 107-34. Snyder, Laurence H. “The Genetic Approach to Human Individuality.” Scientific Monthly 68, no. 3 (1949): 165-71. Strasser, B. J., and B. Fantini. “Molecular Diseases and Diseased Molecules: Ontological and Epistemological Dimensions.” History and Philosophy of the Life Sciences 20 (1998): 189-214. Strasser, Bruno J. “Linus Pauling’s “Molecular Diseases”: Between History and Memory.” American Journal of Medical Genetics 115, no. 2 (2002): 83-93. Beutler, Ernest, interview with Andrea Maestrejuan, March 8, 2007, La Jolla, CA, Oral history of human genetics project (http://ohhgp.pendari.com/). Kalow, W., and D. R. Gunn. “The Relation between Dose of Succinylcholine and Duration of Apnea in Man.” J Pharmacol Exp Ther 120, no. 2 (Jun 1957): 203-14. Haldane, J. B. S. The Biochemistry of Genetics. London: George Allen & Unwin, 1954 @ 125. Motulsky, Arno G. “Drug Reactions, Enzymes and Biochemical Genetics.” JAMA 165 (1957): 835-37; Vogel, Friedrich. “Moderne Problem Der Humangenetik.” Ergeb. Inn. Med. U. Kinderheilk. 12 (1959): 52-125; Kalow, Werner. Pharmacogenetics; Heredity and the Response to Drugs. Philadelphia: W.B. Saunders Co., 1962. See also Price Evans, David A., and Cyril A. Clarke. “Pharmacogenetics.” British Medical Bulletin 17, no. 3 (1961): 234-40; Price Evans, David A. “Pharmacogenetics.” American Journal of Medicine 34 (1963): 639-62. See also Jones (2006) in Deep Background. The well-known malaria resistance conferred by a single dose of the sickle cell allele is in the same biochemical pathway as the glucose-6-phosphate deficiency involved in primaquine sensitivity. Those sensitive to artificial antimalarials are resistant to malaria anyway. Ingram, V. M. “A Specific Chemical Difference between the Globins of Normal Human and Sickle-Cell Anaemia Haemoglobin.” Nature 178, no. 4537 (Oct 13 1956): 792-4; “Gene Mutations in Human Haemoglobin: The Chemical Difference between Normal and Sickle Cell Haemoglobin.” Nature 180 (1957): 326-28. Venter, J. C. “Remarks at the Human Genome Announcement.” Functional & Integrative Genomics 1, no. 3 (Nov 2000): 154-5. Kahn, Jonathan. “How a Drug Becomes ‘Ethnic’: Law, Commerce, and the Production of Racial Categories in Medicine.” Yale Journal of Health Policy, Law, and Ethics 4, Winter (2004): 1-46 (http://academic.udayton.edu/health/08research/drug01.pdf). “Patent Singles Out Ashkenazi Jewish Women. New Scientist, 9 July 2005. (http://www.newscientist.com/article/mg18725073.300). Kahn, “How a Drug Becomes ‘Ethnic’” @27.